In the period of the Norwegianization the majority of the teachers of Sami children were Norwegian. But there were also some Sami teachers. What was their views on the Norwegianization and the aims of the school? We have found that the views have varied widely. Some Sami teachers were themselves eager followers of the Norwegianization, others again worked against the politics of Norwegianization, either openly or hidden. This article recounts some stories from the time 1940–67, before teaching in Sami was offered in school. 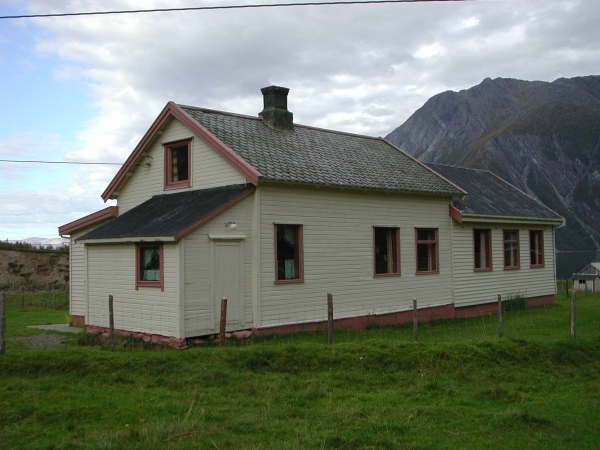 Although the superintendent of schools in Finnmark from 1933 on was more positive towards the Sami language than his strict Norwegianizing predecessors, the politics of the Norwegianization was still in force, and the teachers were not allowed to teach in Sami. 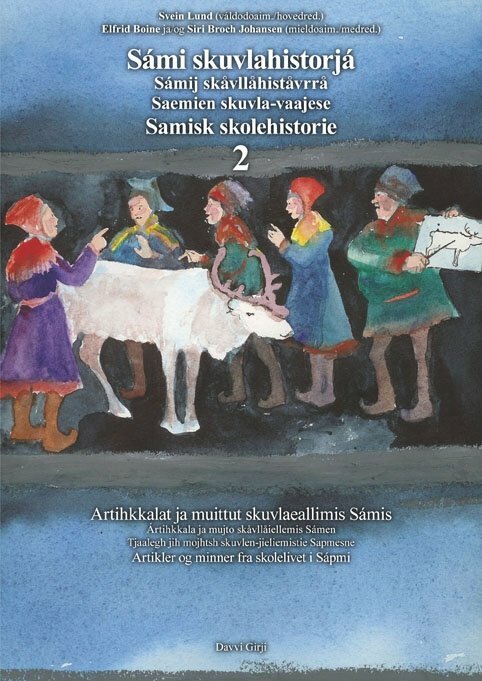 The interpretations of the rule that Sami only could be used as an auxiliary language varied widely, several places Sami teachers did not dare to say a single word in Sami in school. At first some students tell how they have experienced their teachers. Only one of the teachers at the school spoke Sami. His name was Hans Baukop, and he came from Porsanger. He was a very good teacher and a witty guy. He told us fairytales and read religious texts in Sami to us. When he told fairytales he was very lively and made use of all his body. Sometimes he'd also use his voice in such a strong manner that other teachers would come by to ask what was going on. He was a very good teacher to us. But he wasn't allowed to speak Sami, the rules were very strict, not just for the pupils, but also for the teachers. I've learned later that other teachers looked down on him because he was Sami, and that he had trouble with the school authorities because he spoke Sami in school. But at the time we didn't know anything of all that. He didn't live in the boarding school. He had a farm at the other side of the river. There was another teacher who knew Sami language, Jens Eriksen, but he didn't dare to speak anything but Norwegian. I started school in spring 1944, but had only been at school for a few days when the boarding-school burnt down and we had to go home. I remember that the Germans kicked us. I also remember that the teacher didn’t allow us children to speak Sámi, and that he grabbed us by the neck. And that was a teacher who was himself a Sámi speaker. – No one spoke anything but Lule Sami in daily life at home in Nordbukta. Barely in Musken either, the first years I went to school there. At that time we only had Sami speaking teachers. Elin Urheim was my first teacher. Both her and her husband, Mikal, spoke Sami with the pupils, both in the leisure time and in the classroom. So did Kaia Kalstad, who was our substitute teacher for some time, and a couple of other teachers I remember: Magnar Kintel and Ivar Urheim. 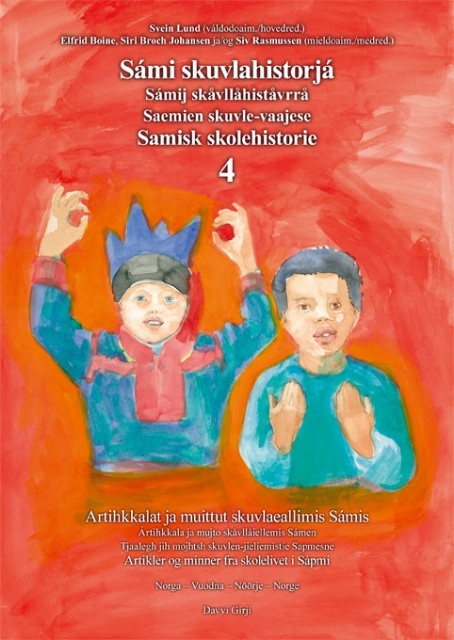 The books were in Norwegian, but the teachers explained in Sami. In this way it became easier for us to understand Norwegian with time. From 4th grade on we were taught woodwork, and the woodwork teacher was Norwegian speaking. He travelled the entire municipality, which meant that we had some concentrated weeks of woodwork lessons at a time. We did not get a monolingual Norwegian speaking teacher until I was in the 5th or the 6th grade. We had to speak to him in Norwegian in order to be understood. He was from Trøndelag, and we learned a lot of Norwegian from him. And football too. When I started school the instruction that the teaching should be conducted in Norwegian language was still in force. So what our teachers did was not legal, strictly speaking. I do not think the municipal education committee was aware of to what extent they used Sami. Musken is a roadless village, and the superintendent of schools could only come by boat. He rarely came to visit, and when he did we always knew in advance. For that day the teachers would solely speak Norwegian. This is how a Sami speaking teacher recounts her experience of the language demand from the school. I was 18 years old and had just finished intermediary school (middelskole) when Guovdageaidnu primary school asked me if I could work as a substitute teacher. It was just what I wanted and I couldn’t wait to get started. Full of expectation I set off for school. There I was given a timetable and some books and then I went to the classroom. I greeted the pupils, they were about 12 years old. Then began my first lesson: nature. The pupils told me they had homework from the textbook about some plant called “charlock” (Sinapis arvensis). I asked: “Can you do the homework?” A boy put his hand up. He stood up and recited the homework from memory, word for word, in Norwegian. I then asked them in Sámi about the plant, nobody knew or had understood what the homework was about not even the boy who had recited it from memory. That was how it was. 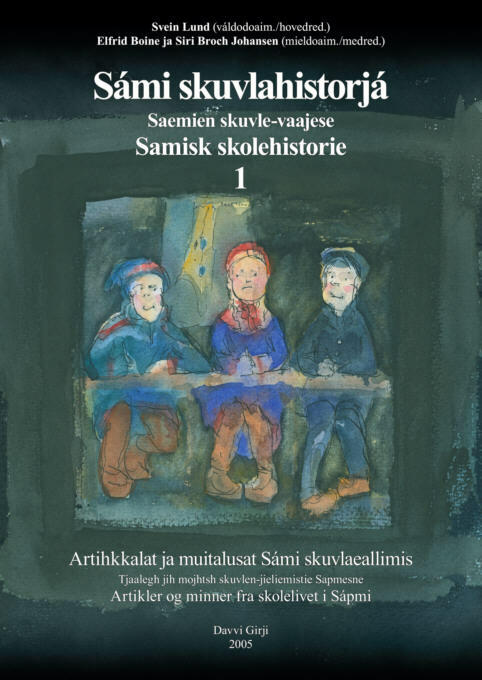 The textbooks were in Norwegian, the pupils were Sámi speaking and the teacher was supposed to teach in Norwegian. Many years passed before I finished my teacher training and returned to Guovdageaidnu primary school. There everything was the same as before, all the teaching was done in Norwegian and the textbooks were still all in Norwegian, although Scripture and the Catechism were given in both Sámi and Norwegian. School board meeting in Máze 1954: Karles Lund, Edel Hætta Eriksen, Johan M. Hætta, Ola Aarseth, Johan O. Hætta, Per N. Sara, Ragnhild Tufto, Svanhild Lund, Alfred Larsen. Some teachers have experienced both the time when Sami could only be used as an auxiliary language and the new time when Sami both became a subject and language used in teaching. Gunvor Rasmussen, from Nesseby, was a teacher in Sør-Varanger 1958-97. Here she recounts how she used Sami as an auxiliary language during her first years of teaching in Jarfjord. Her two pupils at the time might have been the last ones in Sør-Varanger to start school without any Norwegian knowledge. 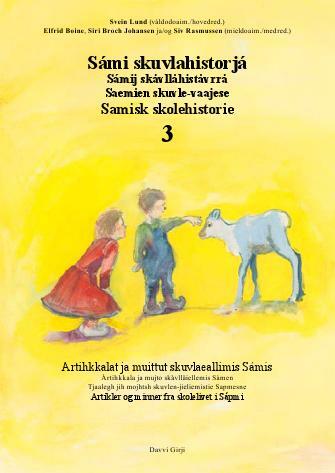 When she was allowed to use Sami again in school many years later, at first it was only a subject for children who originally camefrom municipalities where the Sami language had been preserved better. It would still take a long time until she could teach Sami as a second language to pupils from Sør-Varanger. Gunvor did not start to teach Sami again until in the middle of the 1980's in Kirkenes lower secondary school and Kirkenes upper secondary school, after completing the basic course in Sami at the University of Tromsø. This was with a small group of 2–3 pupils. The pupils came from Sami speaking homes, or had at least one Sami speaking parent, and had moved from Karasjok, Tana or Nesseby. 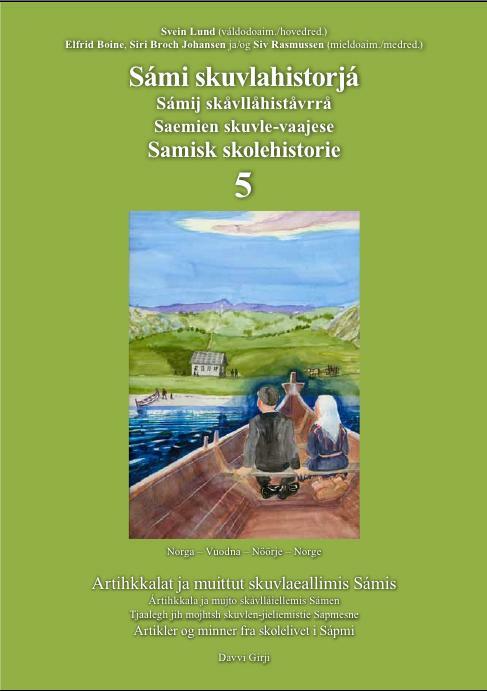 It would still be many years until lessons in Sami would be offered also to pupils who did not know Sami before. – In retrospect you have heard about several people who wished for lessons in Sami, Gunvor says, but who were told from the school that there were no teachers, still I was never asked to take on more groups. 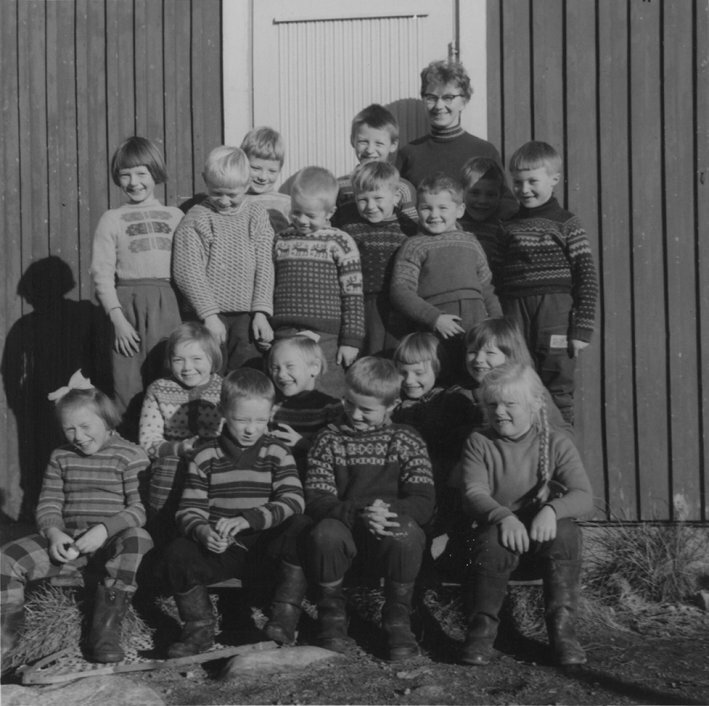 Although the Norwegian Parliament in 1959 in principal had passed that Sami could be a language of teaching in the primary and secondary school, teachers did still have definitive orders not to speak Sami in school. This is told by Ellen Turi Guttormsen, who was teaching in Masi school from 1959-1996. – When I had finished the teacher's college I got a position in Masi school, I kept that position for 37 years. When I started as a teacher I was informed that speaking Sami in school was not allowed. I do not know where the instruction came from, but everybody knew this was how it was. I tried to speak Norwegian with the children, but they did not understad, and I figured that I had to speak Sami to them if they were to learn something. That is why I spoke Sami anyhow. The pupils were supposed to learn to read in Norwegian, but I had to translate everything so they could be able to understand. But most of the teachers did not know Sami, and they had to teach only in Norwegian.